FDA Report: "A Review of FDA's Approach to Medical Product Shortages"
Drug shortages have been having significant impacts on patients and healthcare providers. In order to understand what is causing drug shortages and to enable evaluation of potential solutions, ASPE conducted an analysis of the underlying factors that lead to periods of shortage in the prescription drug market. This report complements the FDA’s report on the current drug shortage problem, which focuses on the FDA’s role in monitoring and responding to shortages. 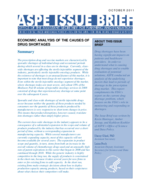 The Issue Brief was written by Kevin Haninger, Amber Jessup, and Kathleen Koehler of ASPE’s Office of Science and Data Policy. Why are Shortages a Feature of the Prescription Drug Market? Appendix A: Drug Shortages Followed by the University of Utah DIS.